Enchanted Rock State Natural Area offers great hiking and views of the Texas Hill Country during the day, plus wonderful stargazing under its dark night skies. Over 10 miles of trails range from an easy half-mile interpretive loop featuring plants and animals living near the base of Little Rock to the challenging Summit Trail leading to the top of Enchanted Rock and its vernal pools. The Park entrance is just 18 miles from the Wine Country Cottages and Wine Country Farmhouse in the heart of Fredericksburg. According to Wikipedia, Native Americans ascribed magical and spiritual powers to Enchanted Rock, and named it “Spirit Song Rock’ for its native legends. It is the largest pink granite monadnock in the United States, rising 425 feet above the surrounding basin of the Llano Uplift. There are eight trails leading to different points of interest in the park. All are detailed on the park’s website, which includes an interactive map. The easiest trail is the Interpretive Loop near the headquarters that highlights flora and fauna at the natural area. The other easy trail is the one-third mile Frontside Trail from the base of Enchanted Rock. Four trails of moderate difficulty are less than one mile each, and take from 30 to 45 minutes to explore. The longest trail is the 4.5 mile moderately difficult Loop Trail that leads around the perimeter of the park, giving hikers spectacular views of the area. The most challenging and rewarding hike is the two-thirds of a mile Summit Hike to the top of Enchanted Rock. Saturdays and Sunday mornings, a park ranger or Master Naturalist leads a group on this Summit Hike. Hikers learn about the history, geology, and biology of the area and are rewarded with some of the best panoramic views of the Texas Hill Country. 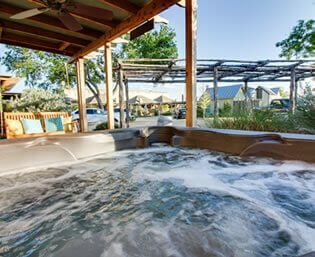 The other reward for your day’s adventures at Enchanted Rock awaits your return to your Wine Country Cottage in Fredericksburg. There you can soothe your muscles in your personal hot tub while you stargaze and enjoy some wine from one of our many Fredericksburg area wineries. Just go online or give us a call at (830) 213-2570 to reserve your “Enchanting” Hill Country vacation soon. Park Hours: 8:00 am – 10:00 pm daily. Gate is closed from 10 pm – 6:30 am. Office Hours Sunday – Saturday 8:30 am to 4:30 pm. All trails close 30 minutes after sunset, except the Loop Trail. Admission: $7.00 per person; children 12 and under free. Entry is free with a Texas State Parks Pass. This entry was posted in General, Outdoor activities, Uncategorized and tagged Enchanted Rock State Natural Area, Enchanted Rock Summit Trail, Fredericksburg TX, TX Hill Country hiking by admin. Bookmark the permalink.